Though written primarily for students of English as a Second Language, The Ins and Outs of Prepositions is also useful in remedial English courses on high school and college freshman levels. Unlike most languages - which usually have only a few prepositions to serve many different communication needs- English has dozen of them and almost none follows any clear, consistent set of rules. 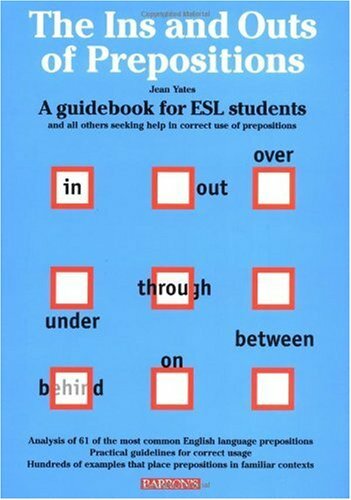 This book offers practical guidelines for correct usage, and provides hundreds of examples that incorporate all of the prepositions into familiar contexts. A total of 61 prepositions are examined. Last edited by arcadius; 07-07-2018 at 10:36 PM. Fantastic post . Thnaks a lot. Last edited by arcadius; 02-26-2016 at 11:20 PM. @Jhony , actually there are 2 working links in the header. I deleted expired ones. I made mirror now. Check it!! !